Crop rotations foster healthy soils and diverse insect communities. Diverse insect communities create a buffer against pest outbreaks. 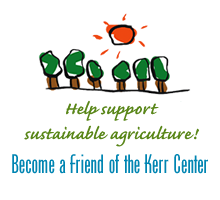 Anyone who’s attended a Kerr Center horticulture workshop in the last umpteen years has been exposed to – not to say beaten over the head with – the idea that crop rotations confer numerous benefits both on the soils they’re carried out on, and on the crops that grow in those soils. Studies hot off the academic presses have just added more support to the notion. On the Cannon hort plots, as on any other well-managed organic farm, rotations are just one among many practices that work synergistically to promote soil health. Recently published research results, however, demonstrate that even without any such other practices, crop rotation alone can boost beneficial soil microbes. Working at the Kellogg Biological Station in Michigan, researchers from the University of New Hampshire and the Unversity of Wisconsin-Madison found that fields with more diverse crop rotations through time also had higher levels of soil carbon (an indicator of soil organic matter) by an eye-popping 33%. Soil nitrogen was also higher in fields with more diverse rotations. Another recently published study reported that cornfields with a greater diversity of insects have fewer pest problems. 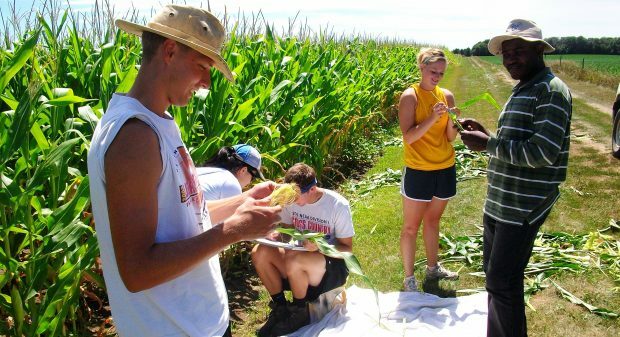 Surveying over 50 farms – both organic and non- – in eastern South Dakota, SDSU and USDA researchers found that cornfields with more diverse communities of insects are less plagued with the pestilential ones. Again, no one who’s spent much time at the Kerr Center in recent years would be surprised to learn that crop rotations are one way of boosting insect diversity in the fields. Another way, as mentioned in last week’s research news, is to maintain healthy and diverse communities of native plants close to cropped ground.